Laura & Alysa (and Ashley too, though she's not pictured here) want to know your favorite books! Time for our next list! This one is a list of books we love. What book have you loved this year? There are no limits on genre, publication date, or reading level. Just leave a comment and we will add your beloved book to the list. Also, what should our next list be? Favorite Best-sellers? 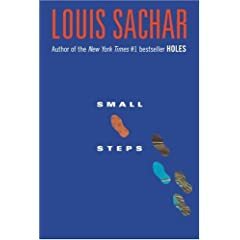 Favorite little-known books? Books that are must-reads for nearly everyone? Pet peeves in books? Vote in the poll to the right. This book is excellent. It is superior in its sphere. It's plot type is age old and has been done a million times and in a million different ways -- which is why I was so surprised that I loved it so well. You know the story. "We're going to a new school and we have to fit in, but really we should just be ourselves." 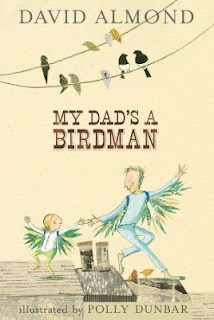 But what you've never heard before (that this book gives you) is the most clear look at what motivates this story. In a book done poorly, you ask the main character "Why are you even trying to fit in with the popular crowd?" and the whole time you are thinking "Stop acting so stupidly. You're embarrassing us all." Not the case with this book! Elizabeth Atkinson has managed to get us inside Alice's head so well that we care about a story we've heard a million times before. Oh, certainly the story has its own unique bits and pieces, Zen being one of the most wacky. But the beauty of the book is that it works. It is so, so well done. I hope it never (ever) gets made into a movie. It would be a terrible one. But, man! It's a great book. Read and enjoy! From Alice to Zen and Everyone in Between by Elizabeth Atkinson. Don't forget about the Anna Smudge contest going on! Phew! What day is it? I have just now officially come back to life as we know it—year 2008—not a dragon, elf, or magical sword in sight. Where have I been for the past few days? Buried deep in the latest installment of Christopher Paolini’s “Inheritance” trilogy-that’s-now-a-quadrology. I know, I’m a little late on the draw. The book’s been out for a few months, but such is its popularity that my name just came up on the library’s reserve list for Brisingr a few days ago. So tonight I finished reading. My assessment: Good. Yep. Just good. My quarrels with the book are these: Sometimes the writing is too self-conscious. You know, when you’re reading a book and you’re suddenly picturing how the author came up with that particular turn of phrase to describe that scene instead of living in the scene itself? That’s self-conscious writing. It’s a semi-jarring experience that authors should avoid submitting their readers to. Quarrel number two: way too much violence. But that’s just my opinion. And it’s the opinion of a girl who, when she saw the first Lord of the Rings, thought she was physically going to die, right there in her theater seat, it was so scary. But still, all the mention of “gore” and “grey matter” and “smearing/dripping/spurting/squirting/drenching/etc. blood” and “smashing/crushing/etc. bones” and all the limb severing was a little more than I could stomach. I mostly let my eyes drift over those parts, of which there were many. 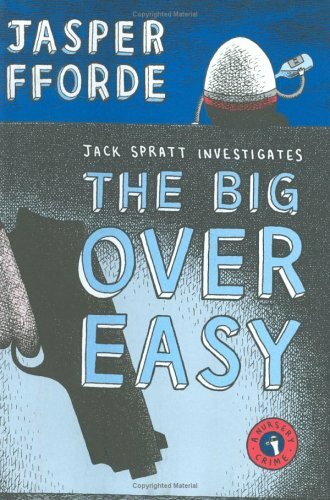 This is definitely not a book I’d recommend to anyone under the age of fifteen or so. In my case, under the age of twenty-four. Quarrel number three: If I was really in love with this series, I probably would’ve lapped up all the extra detail and all the extensive information about, well, everything. But since I just like the series, it felt a tiny bit excessive to me. The first thirty-plus pages of the book (I lost count at thirty) were just a conversation between Eragon and his cousin Roran. No action, just talking. As an editor, I can tell you that I’ve been trained to hack and slash when authors do that. But since he’s an established author and it’s an established and well-loved and much-anticipated series, he definitely has the freedom to do some rule bending, no doubt about it. Aside from that, and if you’re still even reading my own TMI post, it was a good, enjoyable, fantasy-thriller book. I’m excited to see how it ends, but I guess I’ll just put that one on the back burner, since I and all the other “Inheritance” fans probably have a couple-year wait ahead of us. How does someone go up, and not come down? Salim got on the London Eye, in a sealed capsule that took a half hour to view London. When the doors opened, he couldn't be found. This was a very cool mystery. Part of what made it cool was the mystery itself, which has a fabulous twist near the end that confirms (or disproves) your theories and then throws them all out anyway. The other part of what makes it cool is the protagonist. Ted is a kid whose brain works with a different operating system, and it's just cool seeing the world through his eyes a little bit. Oh, also cool because it is an international book, being set in London and written across the pond and such. 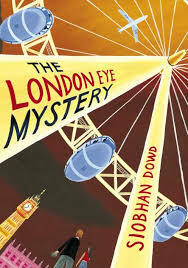 The London Eye Mystery by Siobhan Dowd is a Cybils nominee, and I recommend it to mystery lovers of all ages and especially Lydia.